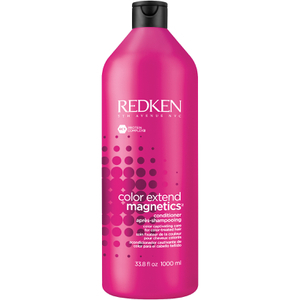 Meet the needs of color treated hair with the Redken Color Extend Magnetics No Sulphate Shampoo; a lightweight formula designed to thoroughly cleanse the fiber and offer gentle conditioning. Enriched with Charge-Attract Complex Amino Ions, the award-winning shampoo is able to form a protective seal around each strand, which helps to seal in colour and ensure hair stays vibrant for longer. The cleansing formula is complete with IPN Technology, which works to reinforce hair’s internal strength, resulting in a fortified, clean and healthy-looking finish. Apply to wet hair. Massage into a lather. Rinse thoroughly. For best results, follow with Color Extend Magnetics Conditioner or Color Extend Magnetics Deep Attraction for extended color protection and deep conditioning. Aqua/Water/Eau, Sodium Cocoyl Isethionate, Sodium Lauryl Sulfoacetate, Disodium Laureth Sulfosuccinate, Sodium Lauroyl Sarcosinate, Cocamidopropyl Betaine, Glycol Distearate, Glycereth-26, Decyl Glucoside, Hydrogenated Coconut Aicd, Parfum/Fragrance, Ppg-5-Ceteth-20, Divinyldimethicone/Dimethicone Copolymer, Polyquaternium-7, Sodium Chloride, Amodimethicone, Peg-55 Propylene Glycol Oleate, Propylene Glycol, Polyquaternium-10, Sodium Isethionate, Carbomer, C11-15 Pareth-7, Benzoic Acid, Disodium Edta, Laureth-9, Glycerin, Tocopherol, Trideceth-12, Benzyl Alcohol, Benzyl Salicylate, Sodium Benzoate, Limonene, Linalool, C12-13 Pareth-23, C12-13 Pareth-3, Hydroxycitronellal, Alpha-Isomethyl Ionone, Arginine, Serine, Hydrolyzed Soy Protein, Glutamic Acid, Benzophenone-4, Hydrolyzed Vegetable Protein Pg-Propyl Silanetriol, Methylchloro-Isothiazolinone, Methylisothiazolinone, Bambusa Vulgaris Sap Extract, Camellia Sinensis Leaf Extract, Sodium Hydroxide, Citric Acid (D159781/2).